Oyranos, the greek word for sky, is the name of a open source Colour Management System. The goal of the Oyranos project is to make end to end colour consistency as easy as possible. Oyranos will ideally work invisible for the colour applications and devices of most users. 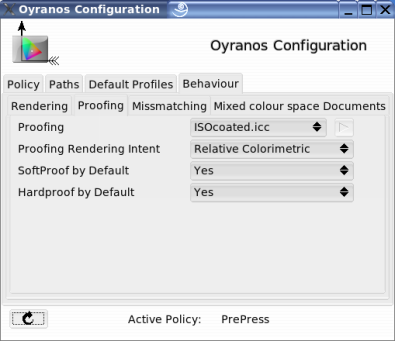 Technically Oyranos serves as a framework for profile handling and configuring, allowing user selectable policies. It will take several assumptions into account to let applications easily communicate with each other. These include path configuration, default profile naming, administration, including lightweight rights handling and option handling. The Oyranos API will remain extensible and independent from toolkits and backends like Elektra or ColorSync. Oyranos is not intended to work as CMM doing direct colour transformations, but in the future it may become a framework for CMMs. The Oyranos package includes the configuration libraries, a small GUI for CMS settings, command line tools and default profiles. Oyranos is a open project. Contributors are welcome. Source are available through git repositories. Contributions can be made as patches or github. For contributions the BSD license is accepted. The API is available in C. Bindings to other languages are welcome. Bug reports and email list information can be reached over the #Communication and Support section. Adding EDID atoms in the root window for additional Xinerama screens:  (https://bugs.freedesktop.org/show_bug.cgi?id=3910) Setting EDID for Xinerama detected monitors can be done in Oyranos with the proprietary nVidia driver only with Xext calls. It would be much better to have the EDID atoms set by standard. This page was last modified 17:57, 15 Mar 2015. This page has been accessed 285045 times. Content is available under The BSD License.